The Atom AE Team won the Finalist Silver Stick banner. The Atom Jr. Flags started off with a 5-0 victory over their pesky rival, Petrolia. Their strong play continued with a 2-1 win over Kincardine team to go perfect on Friday. 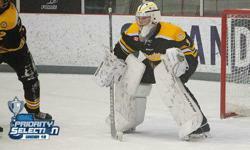 The Atom AE team secured second place in their division after a tight 2-1 loss to Strathroy. Sunday morning will forever be legendary. With a tied score vs. Ilderton, Mooretown wen to a 3 on 3 overtime. The final score of 3-2 propelled the Atom AE team into the finals. The Flags dropped a close 4-3 final. They took home the Finalist banner.